This article is about the limited 4★ Ishtar. For the 5★ , see Ishtar. 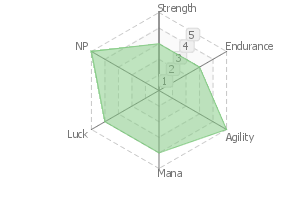 Increases party's Quick performance by 10% and NP Damage by 10% while she is on the field. Ishtar, Goddess of Venus, in summer garb. Truly a goddess-like goddess, she organized a grand event after being moved by the people's piety. She's also a kungfu-style goddess who moves her body nimbly and thrillingly, and burns rubber on her modernized Heavenly Boat Maanna. "Is everyone having fun!? Best time ever? Keep going, reach those limits!" Goddess Ishtar is a free sprit, elegant, audacious, and rather cruel. Yet the present-day outfit mitigates slightly her divine nobility and terrifyingness. Merrier and more magnanimous than usual, she's friendly. Anyone who calls herself a goddess is expected to have mastered one or two martial arts...... is obviously not a thing. 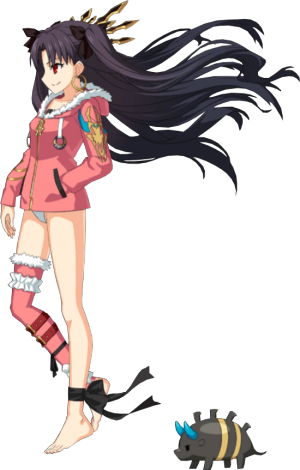 The reason Ishtar can move so adroitly is that the body she occupied was quite adept at both magic and martial arts. Her current fighting style is her own unique spin on the kungfu learnt by the body. "An Uruk Art! Is there such a thing?" Thus comments the king sun-bathing atop the Ziggurat. Rank: EX / Classification: Anti-Personnel / Range: 0–?? As Maanna has become a present-day vehicle, the True Name has similarly been converted to a present-day format. She's set to enjoy summer to the fullest with all that she can muster. 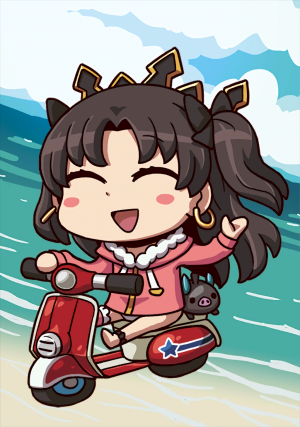 This iridian Noble Phantasm allows Ishtar to raise her spirits by going sightseeing at resorts all over the world on her Maanna Scooter, convert those happy feelings into magical energy, and let it rain down on the earth. Her seasonal outfit easy on the eye, the magical energy pouring down on the earth turns into glittering stars that damage enemies. 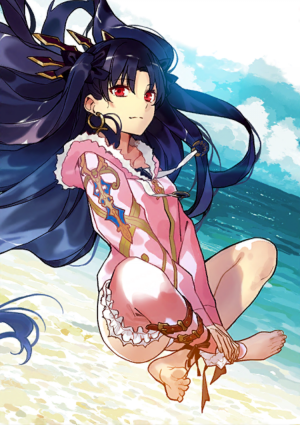 Ishtar herself feels all happy and fabulous, but it really is a great nuisance to the earth below. Ishtar, who manages the Heavenly Boat Maanna, possesses a riding skill that is on a different level and of a different order from that of humans. Of course, "different order" doesn't mean she is "more skillful or faster" than humans. In any case, she's "amazing in all kinds of ways." She does the Uruku drive without much regard for time and space. A skill that changes the Brilliant Crown for a swimsuit. While the Brilliant Crown only affects Ishtar herself, this one benefits the whole party. In exchange, the output is lower. A downgraded version of "Goddess Morph." 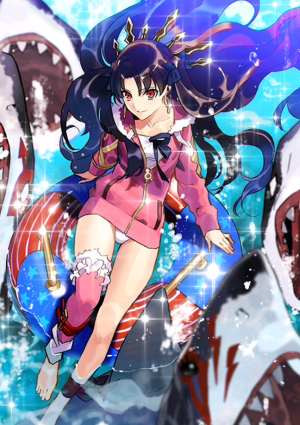 The bow used by Ishtar in her Archer form is the detached prow of the Heavenly Boat Maanna, but this time she has transformed the "oars" of the Heavenly Boat into a scooter that she rides. The scooter has the exact appearance of a modern-day scooter, but its abilities are naturally goddess-tier. It flies high and it goes to warp. There's a mysterious creature fidgeting about around Ishtar's ankles, but she consistently declines to comment on it. Although Ishtar takes an interest in her Master for being a hero with a promising future, she says she's sometimes puzzled, wondering "How come such an average J turned out a hero?" She thinks of her Master as a curious human. It's because she appreciates her Master's popularity (having the trust of other Servants) that she hires him/her as a staff member for the current Ishtar Cup, but......? This page was last modified on 2 August 2018, at 06:55.